This tool is present in the Mageia Control Center under the tab Software management. To work, MageiaUpdate needs the repositories to be configured with rpmdrake-edit-media with some media checked as updates. If they are not, you are prompted to do so. As soon as this tool is launched, it scans the installed packages and lists those with an update available in the repositories. They are all selected by default to be automatically downloaded and installed. Click on the Update button to start the process. By clicking on a package, more information is displayed in the lower half of the window. The print > before a title means you can click to drop down a text. When updates are available, an applet in the system tray warns you by displaying this red icon . Just click and enter the user password to update the system alike. 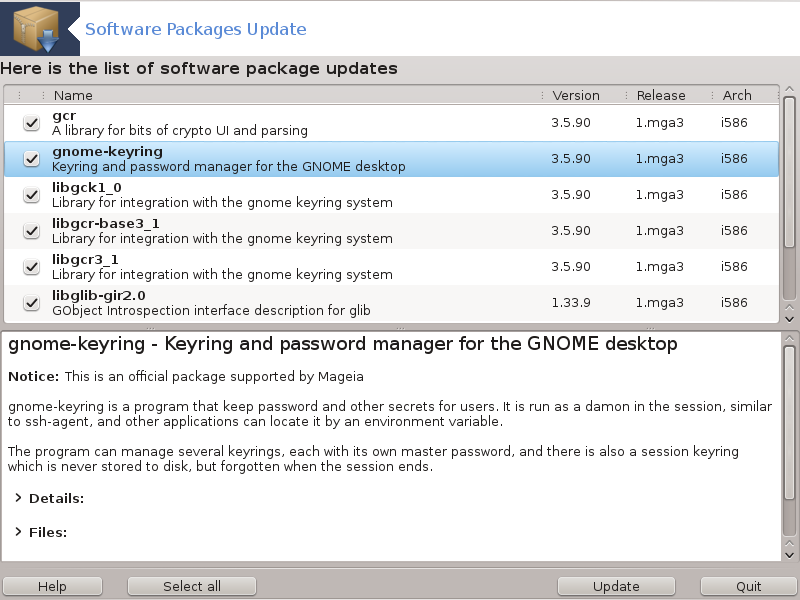 You can start this tool from the command line, by typing MageiaUpdate or drakrpm-update as root.